Departure Time: 7:00 am from Main Station. If your requesting Hotel Pick-up, time may vary. After booking online please call 305-444-4666 to reconfirm booking. You can come to our Main Station located at 305 Lincoln Rd in Miami Beach. Or we can do Hotel-Pick-up. Just let us know your hotel and we will give you the time. Pick up time may vary depending on hotel. Usually between 5:45 am to 7:00 am. Please note: you will receive priority boarding if you come to Main Station. 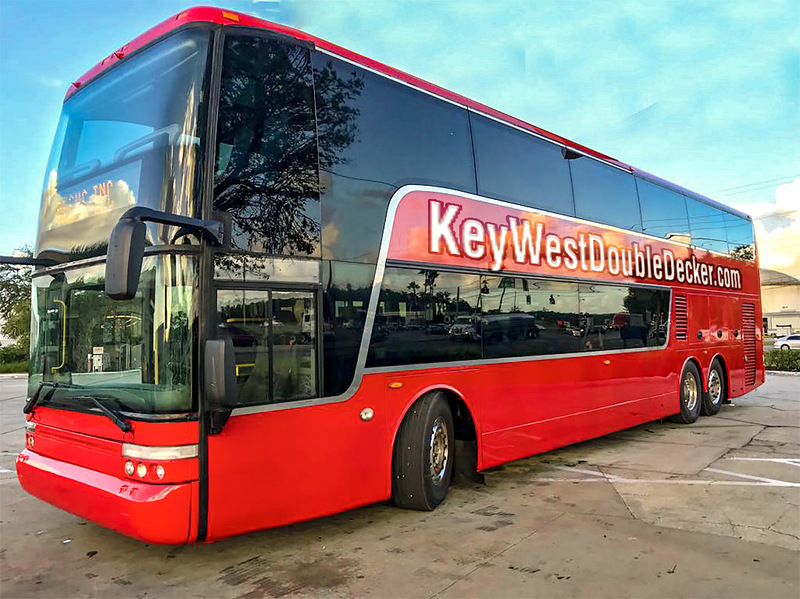 Miami to Key West Bus Double Decker Tour: Our Miami to Key West Double Decker Bus Tour is a round-trip transportation to Key West from Miami. from: 305 Lincoln Road Miami Beach 6:40 am. This is the most popular product because it includes a live narrated tour en-route to Key West. since they are not familiar with area.This bus tour includes 6 Hours of Free Time in Key West.You will receive a map on-board. Any additional activities are available on-board. Discounts for activities are available online prior to departing. No discounts on activity on-board the bus.This ticket is available for purchase online. The Miami to Key West Shuttle is offered either One-Way or Round-Trip. This is the most economical way to get to Key West from Miami. TBook online, receive your confirmation number and come to our store for the departure located at 305 Lincoln Road in Miami Beach. There is a lot to do and to see in Key West. Our "Add-on Activities" allow you to make the most of your time on the Island. Reserve early to lock-in your Add-on Activity Today. You will have 6-Hours of free time in Key West. If your visiting from around the world we recommend at least one (1) "Add-on Activity" per day in Key West.Unless you book an overnight with later return to Miami. Please give us a call for more information on extending your stay in Key West. but then, often individuals consider shuttles to be the best option. Shuttles are a noted shared service that allows you to save money and head for a comfort ride simultaneously. Why vacationers choose the Key West Bus Tour? you can hire a shuttle for your needs. Keep your camera ready and give a kick start to a thrilling drive. to accommodate up to 18 passengers and the motorcoach is spacious enough to accommodate 57 passengers and arearmed with exceptional facilities such as Wifi connectivity. Keys West Tour: You don’t have to walk up to any specific location so as to reach your desired destination. Instead, you can avail pick up and drop facilities from the comforts of your hotel. The drivers hold good experience in driving and are familiar with the route as well. the safety of their passengers to be their top most priority and make every possible effort to make their ride a memorable one. shuttle, sit back and relax while the professional drivers take you to your destination. travelers. With us, you can travel from Miami to Key West in comfort. Plan for a smooth travel with our tours and packages and spot the difference. to explore the underwater marine life, prefer taking a glass bottom boat tour. You may also take a parasailing ride to get spectacular views from above or hop-on, hop-off by taking an Old Town Trolley tour.  Hop-on Hop-off Trolley: With all the fun and exhilarating things to see and do, this trolley tour promises to take you to various prominent areas and attractions. It allows you to hop-on and hop-off where you feel like.  Conch Train Tour: Famous in Key West since 1958, the Conch Train Tour will take you back to the golden age of the Old Town Key West.  Snorkeling Trip: Explore the exclusive living coral reef in the United States and all its splendid inhabitants. When done with your snorkeling escapade, make sure you enjoy a margarita, cold beer or wine while taking in the incredible views of the island city.  Glass Bottom Boat: See the spectacular underwater vistas usually reserved for scuba divers on a luxury catamaran. It’s a great choice for people who don’t want to get their feet wet but still want to explore the charm of coral life.  Parasailing: Suitable for people of all ages, parasailing gives you the opportunity to see implausible aerial views of Key West. touch with us today and head for an awesome short tour to the tropical paradise. Miami to Key West Bus Tour on a double decker bus with all glass panoramic roof. mainland Florida to Key West stimulates sensory overload. Additionally, the natural beauty along the route- teal waters dotted by remote islands, tidal flats and so-called Overseas Highway keeps you hooked on throughout. Miami to Key West: Highway 1 is bedecked with traditional Americana, from tacky gift emporium selling seashell necklaces to burger stalls offering fries and shakes. But then, there is more to it other than just these. Underneath the surface of the ocean, you’ll find an individual world of Technicolor fish and lively coral reefs. paradise is known for its lively locals and is one of the best places for diving enthusiasts. The Southernmost City is home to close by reefs like Sand Key and Eastern Dry Rocks.